SONYC is currently seeking citizen scientists to help with our machine listening agenda. To help us please go to zooniverse.org and take part in our efforts to label urban soundscapes recorded by our sensors. This is a crucial step in training our models, and helping to automatically identify and mitigate sources of noise pollution. Noise pollution is one of the topmost quality of life issues for urban residents in the United States. It has been estimated that 9 out of 10 adults in New York City (NYC) are exposed to excessive noise levels, i.e. beyond the limit of what the EPA considers to be harmful. When applied to U.S. cities of more than 4 million inhabitants, such estimates extend to over 72 million urban residents. The objectives of SONYC are to create technological solutions for: (1) the systematic, constant monitoring of noise pollution at city scale; (2) the accurate description of acoustic environments in terms of its composing sources; (3) broadening citizen participation in noise reporting and mitigation; and (4) enabling city agencies to take effective, information-driven action for noise mitigation. We plan to achieve these objectives by implementing SONYC (Sounds of New York City), the novel cyber-physical system depicted above. This system includes a hybrid, distributed network of sensors and citizens for large-scale noise reporting. In this network, citizens are empowered by apps that help them connect to the city and each other in an effective and responsive manner, while sensors make use of cutting-edge machine listening methods to constantly provide a rich description of their acoustic environment. 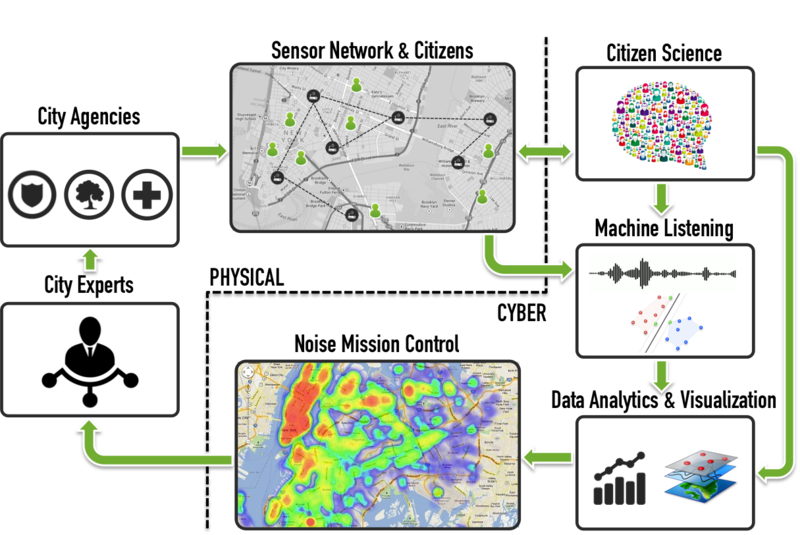 Information from the network flows through a cyber-infrastructure that analyzes, retrieves and visualizes data to facilitate the identification of important patterns of noise pollution: a noise “mission control” center of sorts, intended for decision-makers at city agencies to strategically deploy the human resources at their disposal to act on the physical world. There are significant challenges in executing this agenda, which is why our team includes experts in acoustics, machine listening, distributed networking, citizen science, digital media, machine learning, data analysis and visualization.